Fernley's Black Bear Diner, where we had dinner on Friday, is at East Fernley, which is the east end of Fernley siding on the Union Pacific mainline. (We live almost exactly halfway down the siding, which is why we seem to see a lot of rolling meets as trains pass here.) After dinner, we walked over to have a closer look at the signal and associated equipment, and our timing was just right for a dramatically lit photo. The upper head of this signal (for the mainline) is a standard three-aspect color-light signal. The lower head (for the siding) can display only yellow or red, because there is no case where it would ever display green. 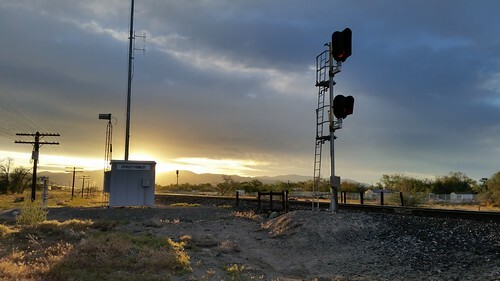 For example, if the signals are red-over-yellow, it means "enter siding at slow speed, prepared to stop at the next signal" and the switch into the siding isn't very fast. The signals here were both red, which may have meant there was a train coming our way, so we got away from the tracks and went home.